1. Persians are heavily boned and tend to be on the heavy side as compared to other cat breeds. Many weigh in excess of fifteen pounds or more. 2. The Persian cats personality is usually very mellow and laid-back. Persians are friendly and mild-mannered cats, but wildly active playmates they are not. They are generally sweet and good with kids, but they nap often and don’t always like to play the way children do. 3. The average lifespan for a Persian cat, fifteen-plus years, exceeds the average lifespan of other cat breeds by up to five years. 4. Persian cats have very large liters, sometimes of up to fourteen kittens. The average for other cat breeds is three to five. 5. Persians come in a wide variety of color variations and are classified into seven different color groups: solid, silver and golden, calico and bicolor, tabby, shaded and smoke, parti-color, and Himalayan. White Persian cats are amongst the most popular choices. 6. A Persian cat’s coat is so thick that it mattes very easily and requires regular grooming, including brushing and bathing, in order to avoid skin infection. 7. Persian cats can be extremely stubborn, sometimes making potty training a difficult task. 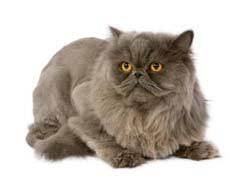 As you can see, there is a lot to know about the Persian cat breed. Owning a Persian is a real delight, as long as you are prepared for the care a Persian requires. It is easy to find Persian cats for sale, but perhaps less easy to know for certain that the Persian breed is right for you. Take deep consideration of the facts on this list before jumping into what is a very serious decision.